This gilt brass circle is richly engraved and decorated. Along the circumference, the disk bears a graduated scale divided into eight sectors, the names of the winds, and, on a protruding portion, two other graduated scales. The surface bears the signature of the author, Baldassarre Lanci, and the date, 1557. 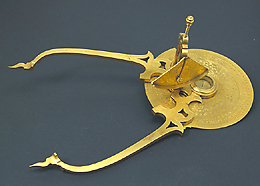 A pivot supports the curved arms of the compass at the centre; one arm is fixed, the other rotates and is provided with a graduated plumb rule inscribed 'B.L.' (Baldassarre Lanci). The instrument was used to carry out topographical measurements of relief and to measure distances and heights, the calibre of cannon and the diameters of projectiles.